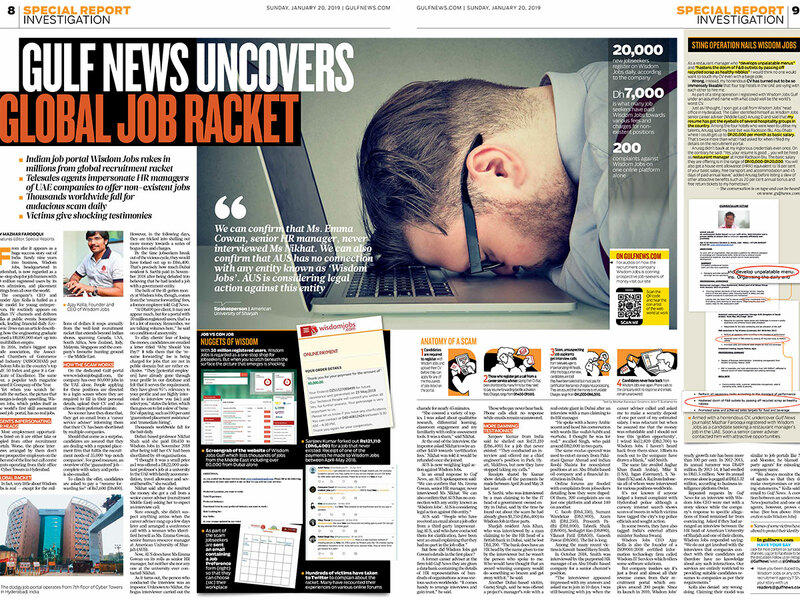 DUBAI: Gulf News’ exposé about a global recruitment racket involving Indian job portal Wisdom Jobs has stirred up a hornets' nest. On January 20, a Gulf News investigation — complete with a sting operation, testimonies of victims and an audio recording on our website — revealed how Wisdom Jobs has been duping thousands of people worldwide by offering them bogus jobs. Barely 24 hours after our report, scores more victims have contacted the newspaper detailing how they were cheated by the Hyderabad-based company, which boasts of 30 million registered users and tie-ups with over 35,000 companies worldwide. An Australian man in Dubai said he was tricked into paying $1,000 (Dh3,670) to Wisdom Jobs on January 17 after being interviewed by a man impersonating the global talent infrastructure & operations director at Boeing. "I had just been laid off and had pinned all my hopes on this new job. Alas, it never existed in the first place,” he said. Another UAE-based victim, Joseph Raghavan from India, said he paid Rs62,000 (Dh3,200) last August. “I lost both parents between April and July 2018. I was jobless and still in grievance when I registered with Wisdom Jobs. Days later, they called to inform me that my CV has been shortlisted but I would have to shell out more money for a phone interview. Out of desperation I agreed. A similar fate awaited Indian expat Varun Gopinath, who signed up with Wisdom Jobs after being made redundant in September 2018. “In the same manner as Gulf News reported, I was contacted by the portal’s Hyderabad office. Their career service adviser offered me a Dh18,000 job, with several additional benefits at FMCG giant Nestle. But to clinch the deal, I had to pay $105 (Dh385) towards registration fees,” Gopinath said in an email to Gulf News. “Shortly after I paid the money, I got an interview call from a woman claiming to be Ms Sini from Nestle’s HR team. At the end of the interview I was asked to remit another $365 (Dh1,340) to Wisdom Jobs. I looked up Ms Sini on LinkedIn and found that she was indeed working for Nestle. "Thinking nothing amiss, I wired the money as instructed. When I didn’t hear back from any one I contacted Nestle’s head office in Switzerland and spoke to their legal counsel. As it turned out, no one from Nestle had interviewed me and the company had no tie up with Wisdom Jobs. They need to be brought to justice and I am sure your newspaper will help do that,” Gopinath said. Job aspirants have paid up to Dh7,500 to Wisdoms Jobs. Most employment opportunities listed on the portal are either fake or copied from other recruitment portals. 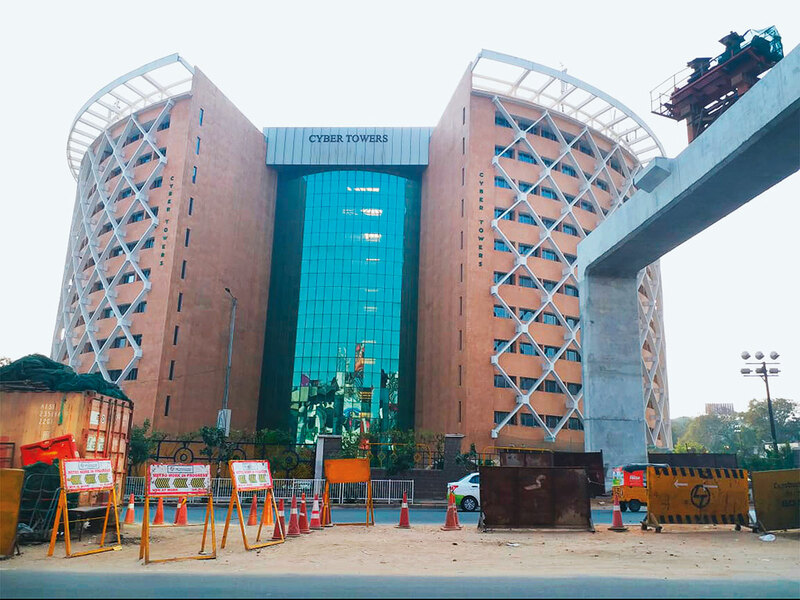 Worse, the phone interviews arranged by the company don’t have prospective employers on the other end of the line — instead, they are call centre agents operating from their office in Cyber Towers in Hyderabad. Wisdom Jobs rakes in millions of dollars annually from the audacious racket that extends beyond Indian shores, spanning Canada, USA, South Africa, New Zealand, Italy, Malaysia, Singapore and the company’s favourite hunting ground — the Middle East. The company’s founder and CEO Ajay Kolla has denied any wrongdoing, saying his portal merely connects employers with prospective employees. Meanwhile, Hyderabad police told Gulf News that they are looking into the matter. If anything about it (particularly salary and perks) is too good to be true, it probably is. Watch out for red flags such as demand for money towards registration/processing fee/other charges. Do your research. Look up the recruitment agent/ company online. Be wary of offers made to you out of the blue. Read the appointment/offer letter carefully and see if the language is sloppy. Job related emails from free email accounts (gmail, yahoo, hotmail) instead of corporate email accounts should be a warning sign. Watch out for fake URLs (websites). Scammers often use fake URLs to mask themselves as large well known corporates.